Its official, I’ve joined the Graze craze! Graze is a brilliant way to stop you from snacking on unhealthy foods. They deliver hand picked goodness straight to your door- the foods you want, when you want! 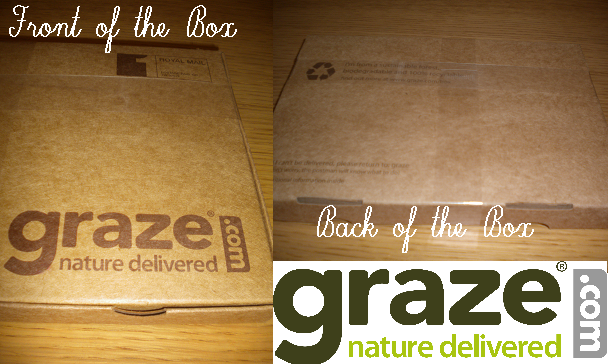 I love getting post but sadly its usually bills that I receive so to get a Graze box in the post each week is lovely! This is the first box i have received from Graze. You just go to their website http://www.graze.com/ and sign up, it literally takes a minute. From there, you are able to choose the days you want your boxes to be sent on and how often. You are then able to select foods you love, like and don’t like from LOADS of yummy food like flapjacks, olives, deli topped focaccia bread, nuts, seeds, dried fruit, some even have chocolate in them. What I did was I just selected ‘bin’ for all of the foods that I definitely don’t like, like olives and coconut so that Graze don’t send me these foods in future. Then every time i get a box I am going to rate the food in the box to say whether I like it, don’t like it or love it. There are two different kinds of boxes that you can receive- the nutritional box which contains only the healthiest of foods and the nibble box which gives you the most variety possible. There are over 100 nibbles to choose from! The Graze team select your nibbles from the foods you’ve said you like so that your box is nutritionally balanced and every week is a surprise. I selected my box to be sent every Friday and sure enough, it arrived with the post on Friday morning. I immediately opened it and started snacking. I was sooo impressed. Graze are big on using good materials; their boxes are made from sustainable forests, they are biodegradable and 100% recyclable. The look great too, especially on the inside where they have an image printed on the both the lid and the bottom of the box. Inside the box there are four compartments with your goodies inside. Simply gorgeous, crunchy cashews, lightly salted. Delicious. Strawberries, white chocolate drops and green raisins. Yummy. AMAZING. Rolled oats, honeycomb and milk chocolate. The nicest flapjack I’ve ever tasted. It really is absolutely delicious- a MUST try. Banana coins, strawberries and giant white chocolate buttons. Mmmmmmm lovely. Ive rated all of these on the Graze website as being ‘love’ foods so hopefully ill receive them again soon! My favourite thing about Graze is how personalised it is. You really get the feeling that they’re doing a service just for you, from the foods picked and balanced just for you, to the emails you receive to say that your box is on its way, they really show that they care. Especially with the personalised booklet you receive inside the box that tells you all the nutritional information specific to your nibbles. It also tells you the use by dates for the nibbles which is great because you don’t have to eat them all at once. I think over the next few weeks I may put some aside to nibble at while I’m watching Christmas films! Price wise, they are £3.49 per box however I used a code to get my first box free and my second box half price. I have a code to pass onto you all as well so that you get your first box free, its: 92VQLMP3. I really think that they are worth the money if you haven’t got time to go out and select your own food like this.I must admit I came across the website AGES ago but I didn’t read the information properly so I didn’t sign up because I thought I was signing up to a contract. How wrong was I and I really regret it now. You only pay for the boxes you receive and you can stop it at anytime so it really is worth giving it a go. You can even tell them when you’re away on holiday so you can miss a week or two. I have noticed that they have changed their boxes slightly with regards to the layout and content since I first found their site but it is a complete improvement. All I can say is don’t miss out, they really are worth a go. As I said, Ive chosen to have my boxes sent out weekly but some weeks I may not be able to afford to have my box sent to me or I may not be using all of the nibbles so quickly as they have a long use by date, so I can always change it to once a fortnight, etc. Its so versatile. You really need to try a box!! 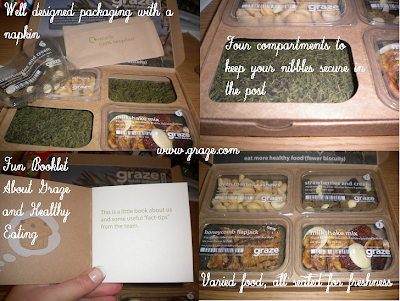 Have you tried a Graze box before? What are your favourite nibbles? Are you going to order a box?